I have hosted hundreds of G Suite webinars and workshops over the last eight years. In that time there have been some questions that I learned to address early on because people always ask them. Here are three questions that I frequently hear from new Google Slides users. Learn more about Google Slides in my on-demand course, G Suite for Teachers. 1. What if I want a copy of the slides in case the internet connection in my classroom isn't working? There are two solutions to this problem. First, you can download your slides as a PowerPoint file. To do that simply select "download as" then select "Microsoft PowerPoint" from the "File" drop-down menu while viewing your Google Slides. 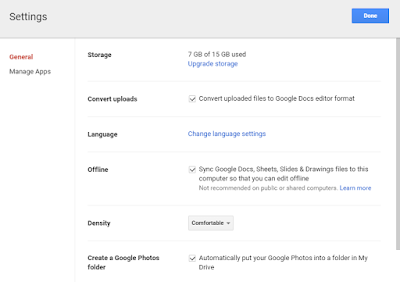 The other option for accessing your slides without an internet connection is to enable offline access for your Google Drive account on your computer. To enable offline access, open the gear icon in the upper-right corner of your Google Drive dashboard. Then select "settings" and check the "Offline" option. (Please note that it enabling offline access is not recommended on a shared computer). 2. Can I insert videos that are not on YouTube? Until earlier this year you could only use videos that were hosted on YouTube. In February of 2017 that changed when Google started to let you insert videos from your Google Drive account without using YouTube. 3. How do I add transitions/ animations to my slides? This is the question about Google Slides that I am asked more than any question. There are two ways to add transitions between slides. First you can simply right-click on a slide in the the slide navigator on the left side of your screen. When you right-click on a slide you will see a menu appear. In that menu there is an option to "change transition." Selecting "change transition" will open a new menu to the right of your slides. That menu will let you choose a transition to apply to your slides. The other way to open the transitions menu is to select "transition" from the menu of options appearing across the top of your slide editor. The animation options appear in the same menu as transitions. Open the transitions menu the click on an object in your slides to animate it. Once you have selected an object on a slide you will see a menu of animation options appear on the right side of your slide.